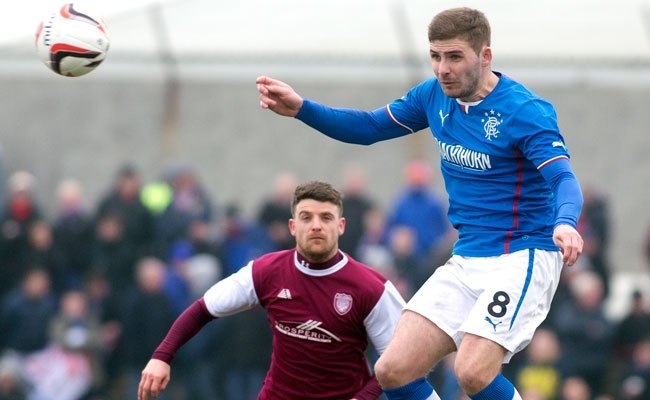 RANGERS continued to build momentum ahead of next weekend’s Ramsdens Cup Final but they left it late to claim all three league points against Arbroath at Gayfield Park. Jon Daly headed home the opening goal after 18 minutes but Paul McManus then equalised for Paul Sheerin’s side on the hour mark, the striker making the most of a mistake from Seb Faure before finding the net with an ice cool finish. With timing running out it looked as though Rangers were heading towards their third league draw of the campaign but with four minutes remaining Fraser Aird fired in the winner. Substitute Calum Gallagher got the ball in from the right and when Daly’s shot was deflected into Aird’s path he tapped it in to the delight of the Gers coaching staff. 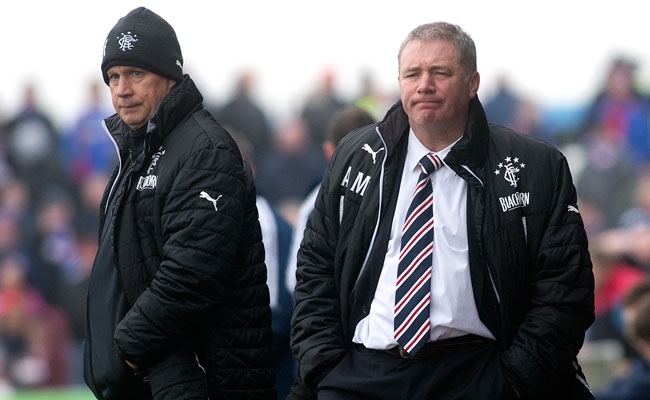 Ally McCoist made no fewer than five changes to his team for this afternoon’s visit to Angus with Bilel Mohsni injured and both Nicky Law and Ian Black out having picked up injuries in the 2-1 victory over Brechin at Glebe Park six days ago. Faure slotted into the centre of defence alongside skipper Lee McCulloch while Kyle Hutton and Robbie Crawford started in the middle of the park. Nicky Clark and Arnold Peralta were also picked ahead of Dean Shiels and Calum Gallagher as the manager shuffled his pack with two massive cup ties against Raith Rovers and Dundee United coming up. Despite a bitterly cold North Sea wind blowing across the pitch and a bobbly, firm playing surface there were plenty of goalscoring opportunities in the early stages of the match. After just two minutes Kevin Nicoll sent a shot over Cammy Bell’s bar before Daly hit a low shot across Sandy Wood’s goal and narrowly beyond his far post. Bobby Linn then stole the ball from Richard Foster but, like Daly, his shot with his left boot went across Bell but was well wide of the target. Chances were coming thick and fast and Linn could, and probably should, have broken the deadlock before Daly did just that. Colin Hamilton’s long-range effort landed at the Arbroath striker’s feet but his shot from a tight angle was straight at Bell who clutched the ball confidently. 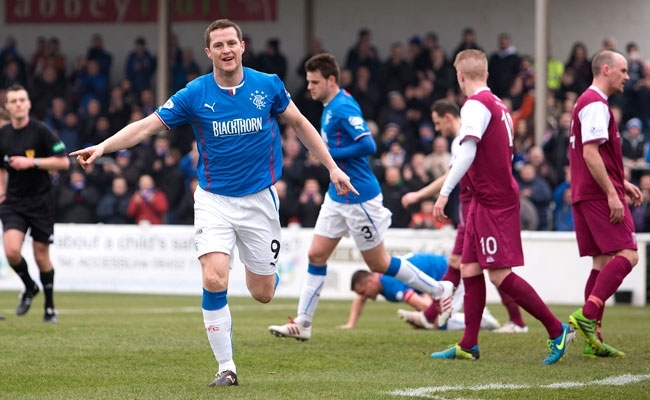 This proved a pivotal moment in the first half as Rangers went up the other end and scored the opening goal. Aird’s cross was met by Daly who powered a trademark header into the net to the delight of the travelling Bears in the ground. With a one-goal lead in place Rangers’ started to control the game as they looked to double their advantage. Crawford hit a shot straight at Wood before Clark’s effort cannoned off a defender before being saved. 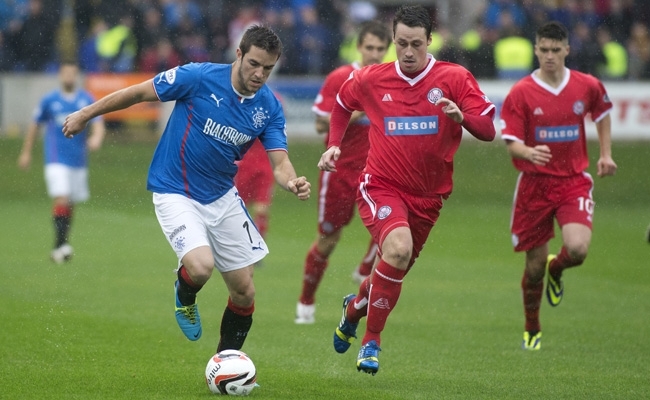 Aird then tried his luck with a 30-yard screamer but the ball cannoned off the bar. After a sustained period of pressure from the visitors Arbroath managed to regroup and before the half-time whistle both sets of defenders worked hard to keep it tight at the back. Into the second half and straight away a cross from Arnold Peralta was met by defender Michael Travis who headed the ball off his own bar. 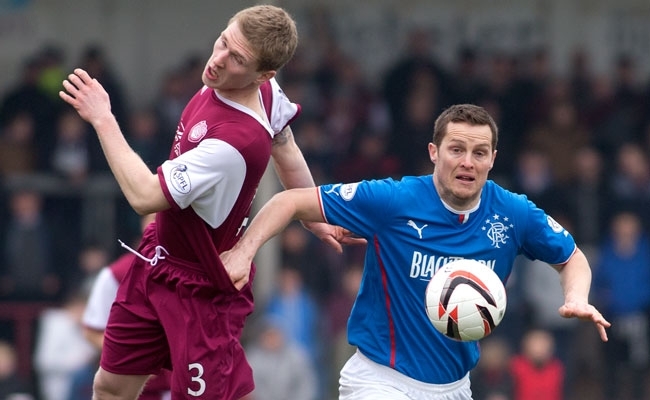 This led to a scrappy period of play before Arbroath equalised on the hour mark. 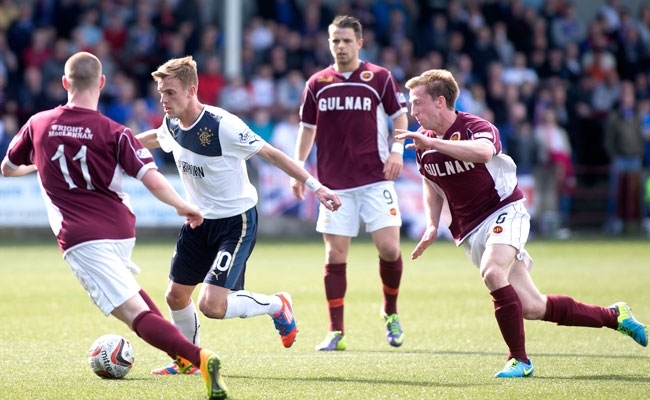 A long ball over the top was flicked on by Faure but it went straight to the home side’s number nine McManus. He had time to look up and with Bell running from his line he produced a composed finish past the keeper. It was a poor mistake from Faure but Rangers quickly pulled themselves together and Aird saw a shot blocked before Daly, under pressure, put another effort over the bar. On 70 minutes Calum Gallagher was introduced to the game, the 19-year-old taking the place of Robbie Crawford, but with the clock ticking down it was Arbroath’s Alan Cook who came close to guiding a header towards goal after good play again from Sheerin. 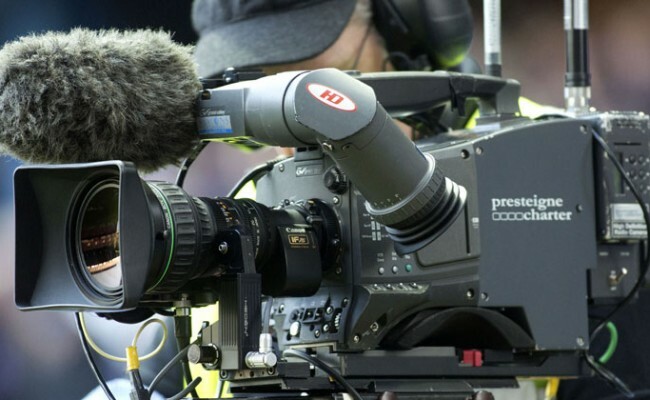 With time running out the Red Lichties’ fans thought their side were holding on to pick up a vital point in their quest to avoid relegation but it wasn’t to be. With just four minutes remaining Aird popped up in the right place and the right time to net the crucial second goal for his side from close range. 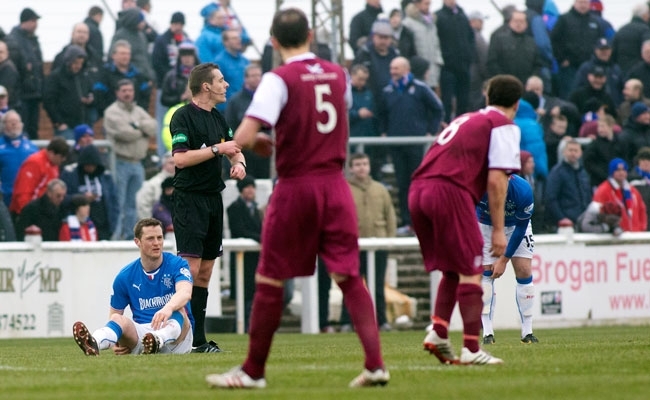 The drama, however, wasn’t finished there and although Faure was guilty of making a mistake for Arbroath’s goal the Frenchman went some way to making amends when he produced a brave block to stop a powerful shot from the edge of the 18-yard box prior to referee Euan Anderson’s final whistle.